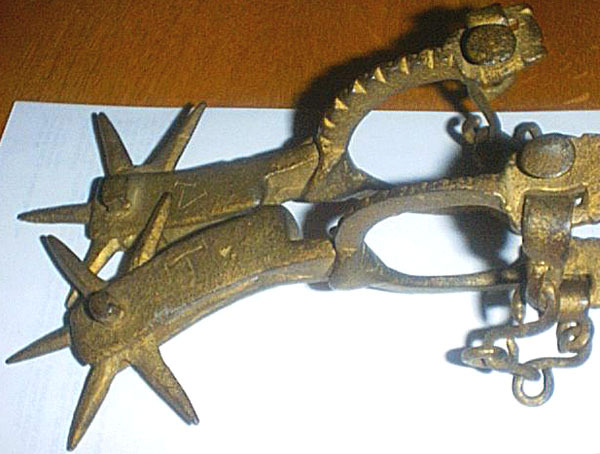 Spurs belonging to 19th-century outlaw Tiburcio Vasquez, found on the Tejon Ranch in the late 1930s by Robert Addington, father-in-law of the owner, Carol Addington of Bakersfield. Note the carved initials, "TV," in the left spur. The carving in the right spur appears to be only a "T." It is not known what the notches (appearing on only one spur) signify, if anything. (Both spurs have ridges on the side nearest the horse.) The spurs were painted gold long ago, presumably by Bob Addington.